On Friday night, Selena Gomez and her mom Mandy Teefey stepped onto the red carpet for 13 Reasons Why, the Netflix show they co-produced. 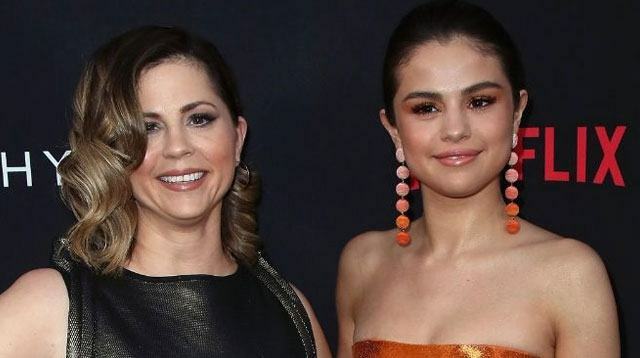 While there, Mandy opened up about Selena's year long departure from social media. She shared with Entertainment Tonight that the hiatus was to help her daughter reassess her priorities and regain footing in reality. "And you know, with her, when she was becoming famous, I was like, 'Aren't you so shocked?'" Mandy said. "It's not an arrogant thing, it's just your day to day, and that's what becomes your life. Then when you go home, or [when I] go to my husband's home in the Midwest, you're like, 'This isn't really real.' That 'all of this about me'and, you know, this lifestyle isn't real." When asked why Selena looked so radiant on the carpet, Mandy said, "I think it was actually [from] taking a break. You asked what it is [like] to feel like you're in this world, we're in a bubble. It's not a real world. You don't really realize it until you go out of this bubble and you're like, 'Oh, OK.'"
There you have it. Social media breaks are good for you, especially if you're famous. With that, I'm going to refresh Instagram and Snapchat and Twitter. I never learn any lessons.